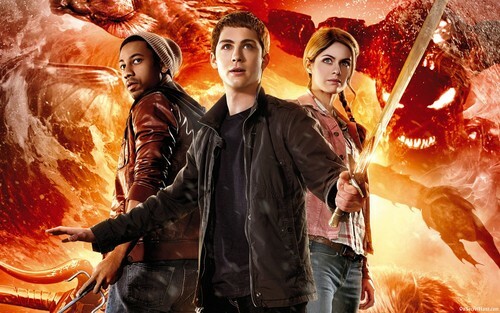 Percy Jackson: Sea of Monsters ಇ. . HD Wallpaper and background images in the Ingrid's Graceland club tagged: percy jackson sea of monsters movie wallpaper poster logan lerman alexandra daddario brandon t jackson. This Ingrid's Graceland wallpaper contains abattoir, butchery, shambles, and slaughterhouse. There might also be 火, 火焰, 地狱, 街道, 城市风貌, 城市环境, 城市场景, 城市设置, and 熟食.